Ronald Reagan Washington National Airport Parking Get discounted parking prices at DCA airport today. Ronald Reagan Washington National Airport Parking : State officials, special guests of state, dignitaries and other notable people are a common sight in the Ronald Reagan Washington National Airport. The reason, Ronald Reagan Airport is close to Washington DC, hence convenient for their flights. Such special visitors need quick facilitation through the airport. That is where our top-notch valet services come in. TravelCar has well-trained valets who understand all kinds and vehicle models. Moreover, you need not worry about parking your state of the art SUV, TravelCar valet team will handle it for you at a very affordable price. Additionally, TravelCar offers discounted parking prices for early bookings at Ronald Reagan Washington National Airport parking garages. 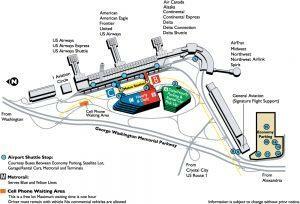 The Ronald Reagan Washington National Airport (DCA) is the most proximal airport to Washington DC. It is located 10 kilometres South of Downtown Washington. It is also the main commercial airport in the Baltimore-Washington metropolitan area. There are three commercial airports in the Washington area: Baltimore/Washington International Thurgood Marshall Airport (BWI), Ronald Reagan Washington National (DCA) and Washington Dulles International Airport (IAD). Ronald Reagan Washington National Airport is a short-haul airport. In adherence to the ‘Perimeter Rule,’ DCA offers flight services up to 1250 miles from Washington DC. Ronald Reagan Washington National Airport was built in the year 1941 and has handled approximately 293,027 aircraft operations as per 2017 statistics. Found across Virginia’s Potomac River, you can reach the airport using the Metro stop on the Yellow and Blue Lines. DCA, formally known as the Washington National Airport, is governed by the Metropolitan Washington Airports Authority (MWAA). In the state of Virginia, DCA is surrounded by the following towns: Addison Heights, Arlandria, Beverly Hills, Mount Ida, Monticello Park, Sant Elmo, Crystal City, Warwick Village, Aurora Hills, Lynnhaven, Arna Valley, Del Ray, East Arlington and Park Fairfax. In the District of Columbia, DCA borders Congress Heights, Bellevue, and Giesboro. Big cities near DCA include Washington DC, Baltimore MD, Norfolk VA and Philadelphia PA. Ronald Reagan Washington National Airport is the 23rd busiest airport by cumulative passenger boarding in the United States of America. 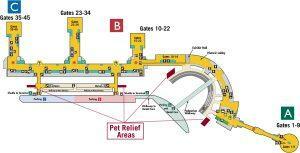 An image showing the parking areas in DCA airport. Moving from one town to another just got better with TravelCar rental cars. TravelCar provides you with high-quality vehicles to ensure your ride to and from the Ronald Reagan Washington National Airport (DCA). TravelCar company allows travelers to use cars listed with the company at an affordable price. Clients enjoy valet services and low-cost parking on TravelCar parking slots. Additionally, TravelCar offers free shuttle rides within the airport to help you catch your flight in good time and help you with your luggage. Booking TravelCar services is a straightforward task. What you need is to log on to the website www.travelcar.com and have a chat with one of the customer service agents. You can also call customer care on +1 888-807-0209. TravelCar ride-sharing services are also available at cruise ports in Washington area to facilitate movement to the Ronald Reagan Washington National Airport. Rides are available at the following ports: Ports of Olympia, Seattle, Tacoma, Almota, Walla Walla, Semiahmoo, Peninsula, Bay Harbor, Port Angeles, Ilwaco, Longview, Shelton, Vancouver, Central Ferry, Kalama, Allyn, Blaine, Everett, and Skagit. You can also access rides at the ports of Port Gamble, Wilma, Clarkston, Edmonds, Woodland, Port Townsend, and Port of Washington-Dulles, Virginia-5401. Metro-rail serves the Ronald Reagan International Airport on the Yellow and Blue Lines. TravelCar is a ride-sharing service that understands the needs of its consumers. The firm employs qualified drivers who are very professional in their work and are licensed to navigate passengers within the Washington area and beyond. It’s no wonder the company is ranked higher than a score of 9 in Trustpilot and similar ranking sites. Parking is available at affordable prices at the Ronald Reagan International Airport and in all major towns. At the DCA, parking is very close to the terminals. The firm offers a free shuttle service to the terminals. It won’t take more than five minutes with TravelCar shuttles. A critical benefit that you can derive from TravelCar is the ability to access long-term parking at its various parking areas. Long-term parking attracts revenue since your vehicle is rented out to other travelers. The income is dependent on the mileage your car has covered. The listed vehicle is insured, cleaned and serviced while you are away. Get a nice car wash for your ride from TravelCar ride-sharing facility. We also do waxing and polishing of vehicles and other forms of car maintenance. Once you return from your trip, you will get your vehicle in perfect condition. Vehicles under TravelCar are well-guarded, complete with 24-hour video surveillance. Parking lots are secured with gates and manned by guards. The good thing about our services is that we are consistent and pretty much everywhere to cater to your traveling needs. Ride-sharing is a phenomenon that is increasingly gaining in popularity due to its potential in reducing strenuous traveling activities to and from busy airports. You need not worry about where you will leave your car or the expensive rates for long-term parking. Leave your car with TravelCar and make money as you are way above the skies. TravelCar offers the best prices in the market with free fare quotes available on TravelCar website. Online reservations on the website attract an awesome discount on rates. Reservations help you as a traveler to plan your journey in good time to your desired destination. Valet service is a parking service extended to a traveler by a TravelCar employee. The main aim of valet service is to provide a client with the convenience of transit within the airport. It is necessary and highly recommended if you are in a rush, there is bad weather or when you have bulky luggage. Additionally, the service delivers a level of satisfaction to sophisticated clients. The advantage valets have over other people is that they can do stack packing in seemingly congested parking lots. The valet team at TravelCar parking slots are well versed with different car models and are insured by the company. Services are also available to disabled persons in wheelchairs. Ronald Reagan Washington National Airport is connected by George Washington Memorial Parkway, U.S Route 1, State Route 233 and the Interstate 395. DCA has a wide array of amenities such as the USO lounge for military personnel, three nursing rooms for lactating mothers, and free Wi-Fi throughout the airport. Restrooms are available for all genders. Diaper changing surfaces are available for kids in the restrooms. At the Ground Level of Terminal B, four charging stations are available for electric cars. There is a Cell Phone Lot for drivers awaiting their passengers for a maximum of one hour. The land currently occupied by the airport was formerly a colonial plantation and the birthplace of Eleanor Curtis, the grandchild of President Bush. The property is rich in historical information and Abingdon artifacts. The history is displayed in the airport primarily in the Exhibition Hall that links Terminal A to Terminal B. The Exhibition Hall contains Abingdon’s artifacts and displays them together with video presentations in the art program. Ronald Reagan Washington National Airport is famous for its friendly nature of treating clients. Elevators within the airport are fitted with Braille buttons for individuals using wheelchairs. Traveler Aid Volunteers are dressed in royal blue vests are stationed at the information desk. Their role is to guide travelers as they have a wealth of information regarding the airport and its environs. If you lose an item on the plane, you are advised to contact your airline. For items lost in the terminals, travelers can reach out for help via the contact 703-417-0110 between 7:30 am and 4:00 pm. Previous visitors rated DCA the easiest airport to manoeuvre in and out in the Washington area. Enjoy traveling in and out of DCA with the best and most affordable parking prices at TravelCar.